Cancer is a dreaded disease that most people may have encountered in their lifetime, whether it was a close family member or friend, someone, somewhere has been affected. In my case I've experienced it through the deaths of both parents. 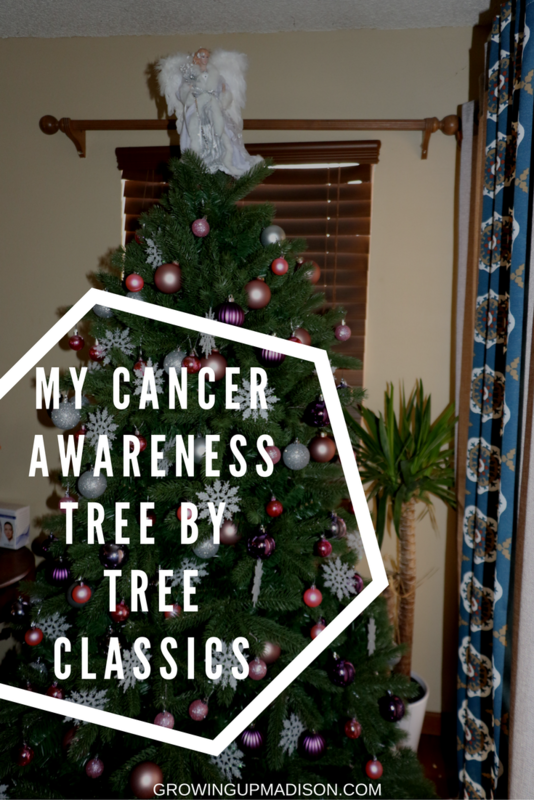 I recently got an artificial Christmas Tree by Tree Classics in the month of October and decided that it was going to be our cancer awareness tree, but life got in the way and we didn't finish it until now, in the month of November. The one thing about decorating a tree before the holidays is how difficult it can be getting decorations, but that didn't stop us from trying. 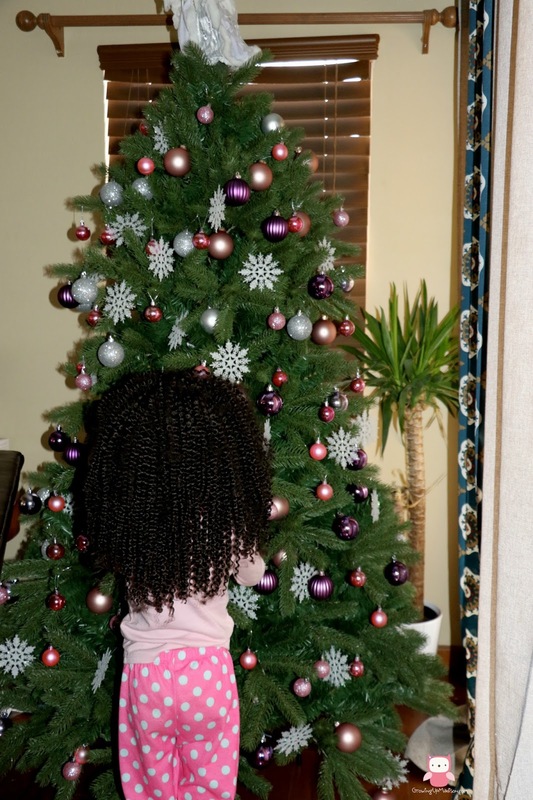 So why did we decorate our tree and called it our cancer awareness tree? I love showing my support for cancer causes. One of my aunt passed away from breast cancer when I was a little girl. I remember going to her bedside and speaking with her just a few days before she passed away. When you're a little girl who haven't developed her own breasts, it's a scary thing having a member of your family pass away. I was scared because I thought at the time that I would also have breast cancer and die. I have had a few scares over the years with benign lumps, but one of the things I do is get checked yearly. My own mother passed away from cervical cancer. Cancer doesn't care that you're right or poor, old or young, it doesn't see the color of your skin, it takes without discrimination. My mother was vibrant and outgoing and I saw her as a former shell of herself but still with the will to survive. November is the Movember movement and we tend to focus on the men, because after all they too can pass away from cancer. My dad was one who died from prostate cancer. Most men don't take the time to go to the doctor, until they're very sick. We need to encourage them to see their doctors more often. My dad was very much the same. If he didn't think he was dying, there was no need to see a doctor. Getting a yearly check up can help to diagnose or even eliminate problems before they happen. We decided on using pink and lilac balls along with silver and added an angel at the top of our tree instead of star. Our angel symbolizes our dear departed loves ones who have gone on to the other side and are now looking down upon us. Our guardian angels as I like to call them. So why did we choose Tree Classics for our tree? Well not only are they beautiful but they are also fairly inexpensive. They are easy to put together and once done, they look really realistic. I have put trees together before that took quite some time but the instructions were easy to understand and it took very little time from start to finish out of the box. I decided on an unlit tree since I didn't want the lights to detract from the decorations and I was happy I did. This is going to be our Cancer Awareness Tree that I intend to highlight every year in my home. I plan on redecorating this tree once there are more decorations in store so you can see the loveliness that is a Tree Classics tree. So if you're looking for a tree for any occasion or even the holidays, consider a Tree Classics tree today! AnnMarie John is a lifestyle blogger, wife, mom of 4, retired army veteran and a believer that travel makes your soul rich. She believes that everyone needs to get out of their comfort zone and visit at least one new place a year, and she's on a journey to make that happen. Join her on her adventures.